Our team at EzCare Medical Clinic have worked with thousands of pet owners who view their pets as trusted companions and forms of treatment for their emotional or mental disorders. These pet owners understand that their pets are a crucial part of their therapy and they understandably want to be with them as much as possible. These owners are interested in getting legitimate letters designating their pets as emotional support animals so they can live with them in housing that does not allow pets and so they can travel with them in the cabins of airplanes—both with no additional fees. Unfortunately, there are other businesses out there that want to take advantage of those with emotional or mental disorders. Scam sites like RegisterServiceDogs.com do not meet the requirements to provide valid ESA letters. Here is how to tell they are fraudulent. This website claims to register both emotional support dogs and service dogs and provides packages that include vests, certificates of registration, ID tags, and other products. It’s easy to spot that they are a scam because they use the word ‘registration’. You cannot register an emotional support animal and there are no valid registration lists of ESAs. An owner applies for an ESA letter and it is valid for all animals they have designated as support animals. Our team at EzCare Medical Clinic never uses the word ‘registration’. We offer valid ESA letters written by licensed health professionals that are guaranteed to be authentic. This site is clearly not legitimate. Not only do they use the word registration repeatedly on the site, but they also do not even say they provide ESA letters. Instead, they offer packages with ‘registration certifications’. These are not valid forms and will not stand up when examined by landlords or airline personnel. In addition, there is no mention of a physical location for the business nor is there a phone number to call for questions or concerns. In fact, the only way to get in touch with those at this site is through a contact form. Those that provide legit ESA letter must have physical locations with licensed physicians or LMHPs working there. These professionals must also speak with patients to verify they qualify for ESA letters. This site does not have that and even mentions that doctor’s notes are not needed to qualify. EzCare Clinic has a physical location and phone number listed on the site. Our licensed health care professionals talk with every patient in person or via our telehealth system and we are upfront about the cost of the letters. We also offer money-back guarantees on them. Our team at EzCare Clinic wants you to benefit from having your emotional support animal close to you at all times. 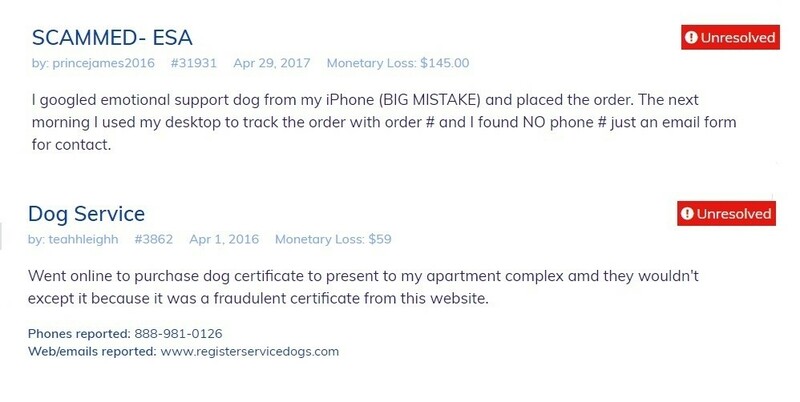 We also want to protect those with mental or emotional disorders from being scammed by sites like RegisterServiceDogs.com. When you know which red flags to look for, you can determine which sites are legitimate and which are not and you can get valid ESA letters from companies like ours. Get Your ESA letter online or in-person.